Outside the US, Mercedes sells an Outbacktified version of the E-Class wagon called the E-Class All-Terrain. This is not that car. Oh no, this is something else entirely. The regular E-Class All-Terrain wagon is a pretty typical Outbacktified luxury European station wagon. Since it’s made for the European market, it’s equipped with a turbodiesel 2.0 liter 4-cylinder making 194 hp and 294 lb/ft of torque. Here it is, pictured in its natural habitat. The E400 All-Terrain 4x4² is the brainchild of one crazy Mercedes engineer named Jurgen Eberle who for whatever reason Mercedes decided to give a huge budget to design custom portal axles for the E-class independent suspension which along with other assorted tweaks give the E400 All-Terrain 4x4² a total of 17 inches of ground clearance. 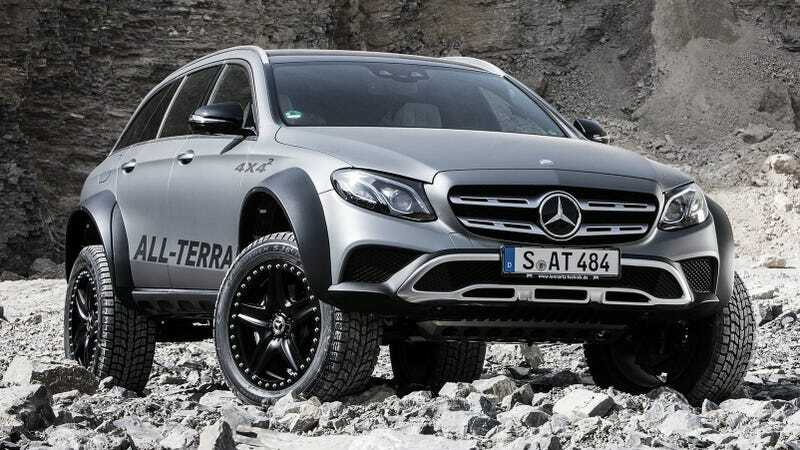 As you can probably guess from the name, the E400 All-Terrain 4x4² ditches the 2.0 liter turbodiesel for the 3.0 liter twin turbo V6 that makes 329 hp and 354 lb/ft. Anyway, Motor Trend checked the thing out and has a video.